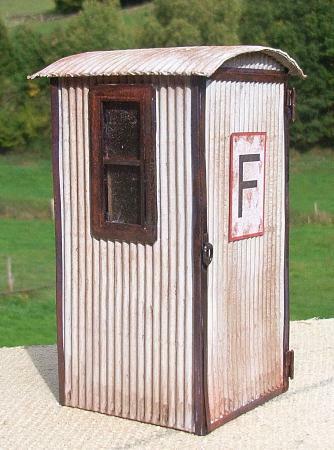 just finished the new call box for my layout. Material: cardboard, dispersion-paint and powder-pigments. Very nice Rudolf, really like the detail on the door. nice one. who needs Pola when you have cardboard. Tempted to try something like it in 1/12th as I have rolls of corrugated cardboard just right size. Hi Rudolf, nice model and very good subtle weathering. Thank you very much for the appreciative answers. The call box will find it´s place in the forefront of the Ebbes-Werk, which means "something-works". Something, because they must produce something there, but I don´t know what. @Matt: yes there are photos. http://www.buntbahn.de/modellbau/viewtopic.php?t=7068 This link leads to my main project. I work on it since some years. 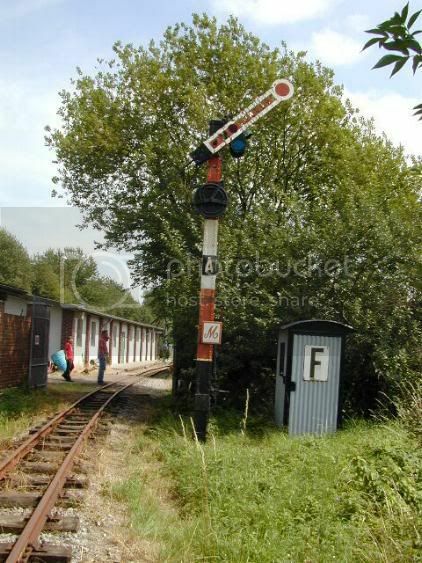 Theme is a meter-gauge-railway in the Odenwald round 1960. OEA means “Odenwälder Eisenbahn AG“ (Odenwald Railroad Inc.). My actuell project is a cheese dairy and the forefront of the Ebbes-Werk. All in all I´d like to say, that my projeckts are less an exact copy of reality but more a humorous piture of things and dotty characters of my home region. Last edited by Rudolf on Fri Oct 09, 2009 6:43 am, edited 2 times in total. Wow Fantastic modelling Rudolf So much detail and atmosphere. You've really inspired me. The " F " on the door stands for "Fernsprecher", a vintage word for "telephone" No one would understand today. Great work Rudolf ! The call box is impressive, then we looked at the links and saw your other models wow ! Another of those shots that could easily be mistaken for the real thing ! Dave & Lorraine, more ideas than space, time & finance permit ! Looks great! How did you model metal with cardboard? this is really simple. First of all I used dispersion-colors and painted everyting in grey. After drying I coloured the edges black, using an edding3000. After that I took just a little bit of black powder-pigments and gave them into water. This shoulld happen in a way, that the fluid gives just the idea of a soft black dust. Not more. I wetted the call box all over with it. The result is a grey and dirty finish. Let dry. Then I used powder-pigments and dusted them (dry) with a very soft little brush onto the places, where I wanted to have earth, dirt, dry and wet rust, rests of green vegetation and so on. The rest of the pigments I brushed away with a hard brush. You can get those powder-pigments in artist shops. I hope I could explain my method in an understandable way. Explaining things like that I see very soon, that my English has narrow frontiers. "Fernsprecher" is a composition of two words. "Fern" is an adjective and means "far" and "Sprecher" is a substantive and means "speaker". The German language is common for it´s word-compositions, sometimes existing out of much more than only two words. it can get worse. There is for example the famous Donaudampfschiffahrtsgesellschaftskapitänsanwärtersgatinnenpensionsanspruch. Nine words, great! (Entitlement to a pension for the wife of the aspirant for the job as a captain at the steamboatcompany on the river Donau). Wow, “steamboatcompany”. It also goes in English! Are we a little bit off-topic now? it´s done. The OEA has it´s new call box. The last grinding will be made, when the ambience is finished. The materials for the green are different kinds of herbs and grasses, some of them crushed plus a very, very little bit of foam-flocks. PS: The next time I should regard to keep my camera straight! Looks terrific Rudolf Good idea to use herbs has scale trees. Works well Do they still smell Gnice? oh yes they do, indeed! At the moment my layout-room smells like a mediterranean kitchen. in that case remind us not to use dried herbs when we get to the scenic stage or we'll be permanently hungry ! That's very effective, looks a little like a large buddleia to us, very effective, well done Rudolf !